At Big Red Texas German Shepherds Ranch, we are a family oriented World Class German Shepherd dog breeder, specializing in raising only true deep red and black West Showline German Shepherds. Honesty, Integrity, and Quality are the values our business is founded on, providing the highest standard of personal service for our clientele. 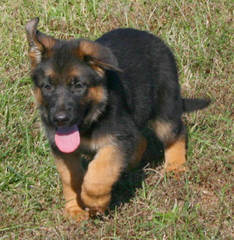 We specialize in big red and black West Showline German Shepherd puppies. This is our love and passion. Our desire is to provide you with an exceptional puppy that can bring you the same love, care and joy that we have enjoyed from ours in our family, into your home. Here you will find only the finest West Showline German Shepherd puppies for sale, whom are bred to be phenomenal companions, personal protection, family security, watch dogs, service dogs, therapy dogs, search and rescue, and more. Although we have West Showline German Shepherd puppies for sale in Texas, arrangements can be made to ship and sell a puppy to any state within the 48 contiguous states. Please visit our "Puppies For Sale" page to see what German Shepherd puppies we have available now. All of our German Shepherds are carefully and individually selected for their Extreme Intelligence and their Ultimate Champion Bloodlines, to produce and enhance the specific desired qualities and traits that we constantly strive to emphasize in our dogs. I am looking for a G. S. male to breed with my 2 year old G. S.(3/4) Bel. Mal.(1/4). I live just off F M 713 between Delhi and Cistern, so when I saw you are in Dale, I was delighted. Do you offer stud service?